The South’s Premier Building and Construction Company. We offer a wide range of building services, including extensions, renovations, loft conversions, kitchen & bathroom design, for both domestic & commercial customers. We can provide you with a friendly and reliable service and provide you with a ‘Best Value’ approach to your needs. Limewood Builders can also ensure that the quote is inclusive of everything you need to achieve your requirements. All staff within our company are fully qualified professionals and offer a competent and friendly service. As a professional company we always strive to ensure that our staff and our methods are fully up to date with current industry standards and matters of good practice. Health and Safety is a fundamental consideration in all our design processes and methods of construction. We always ensure ours and yours, as the client, responsibilities fully meet all obligations laid down by local authorities and current legislation. As a responsible company we are also compliant with all guidelines and matters of good practice in respect of environmental and ecological considerations. To that end we offer a fully sustainable design using ‘Green’ Building resources and techniques and ensure our construction practices meet all legislation regarding waste management and ensure our impact and your carbon foot print are minimised both in creating but also as an ‘end user’. Our head office is based in Portsmouth but we cover the whole of the south of England. 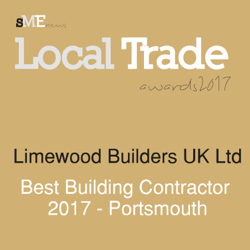 After weeks of intensive research, LIMEWOOD BUILDERS UK LTD has been awarded: Best Building Contractor 2017 – Portsmouth & Excellence Award for House Extensions Services – South England. Refurbishment, new windows, kitchen, bathroom, soundproofing the floor and new front door.